Multipoint's generally operate in the same way regardless of the type or number of locking points. They can be simple rollers or large hooks and bolts or any combination. The most common is operated by lifting the handle which operates the locking points, then the whole system is locked into position with the turn of the key in the cylinder, commonly know as the barrel. Be aware over the past few years many manufacturers have altered or even ceased production of various products and unfortunately in some cases if your product is 10 years or older, it is possible that your system is no longer available. Therefore if your system fails and you require a replacement, it is likely to be more costly due to the fact that a new one will have to be made to fit which is not a 5 minute job. For more information and with no obligation, call RTH Locksmiths in Birmingham on 07548 027313. This is for your information only and not intended as anything else. Should you experience difficulties, please contact a professional and DO NOT remove your lock from the door. 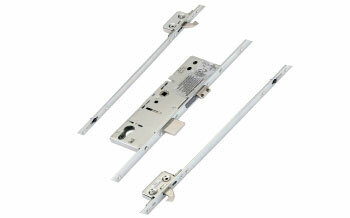 UPVC door mechanisms are produced by a number of manufacturers and in many more variations and styles. However, the principle in the way they all work is pretty much the same. Firstly it should be noted that these types of locks known as multi point locking mechanism are also sometimes found in wooden composite doors and not just UPVC. When mechanisms in composite doors go wrong in the closed and locked position, it can cause other problems. Most of the time there will be obvious signs that the system or part of the system is going to fail. Do not leave it until it because it could unfortunaley beccome more costly and fixing it will be harder. The above mentioned signs can mean a number of things. It could be as simple as the door alignment has been effected or as serious as the internal working parts have broken or seized or a fault lies in the locking cylinders themselves. It is advisable to have a professional service the door catching any problems in the early stages as its cheaper and a lot simpler to correct our Birmingham Locksmiths can help with minimum cost. Local Locksmith Services, RTH are a reliable 24 hour Birmingham locksmith company and for your convenience we have adopted a customer focused approach in all our services. We work exclusively with our local locksmiths who have achieved top quality standards within their work. Locksmiths for business, car and home.